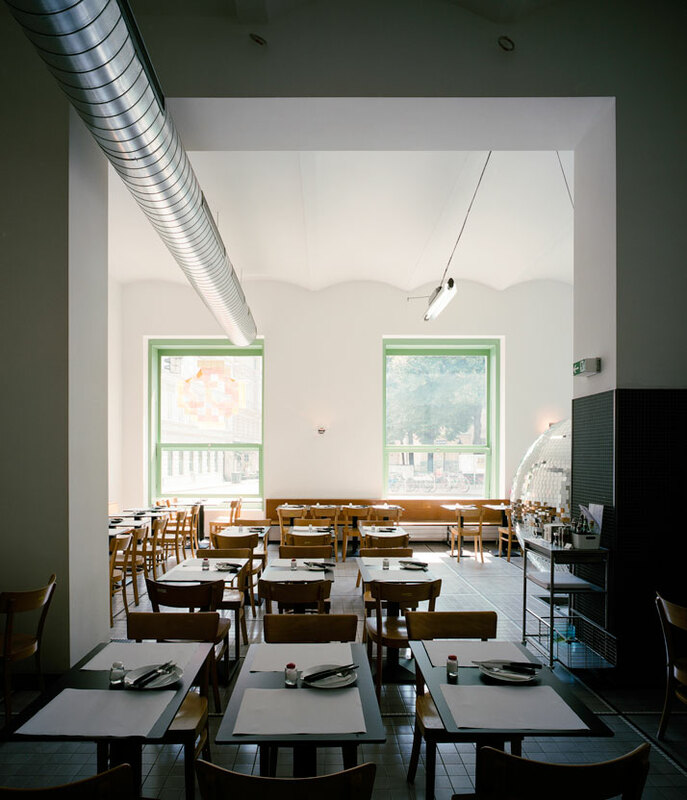 As the Italian food craze continues with its Vienna takeover, Maria Fuchs opens her second Italian outlet, with something rather out of the ordinary, something more than just the mozzarella and tomatoes on the pizzas that are served. 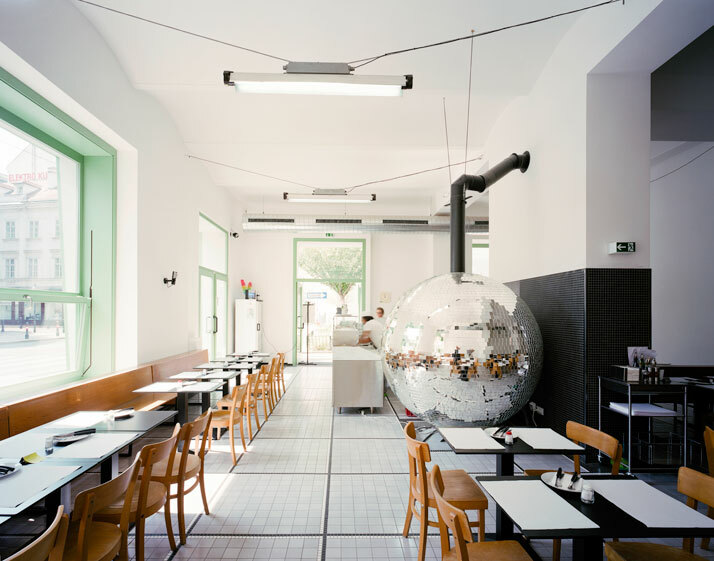 Designer Lukas Galehr (Madame Mohr Studio) has given a glittery space-age feel to the minimalist interiors of Disco Volante, the pizzeria that’s taking Vienna’s sixth district by storm (address: Gumpendorfer Straße 98, Vienna). Although Disco Volante actually translates as ‘flying saucer’, it’s more reminiscent of James Bond villain, Emilio Largo’s escape vessel or the famous fifties car (later brought out again by Alfa Romeo). 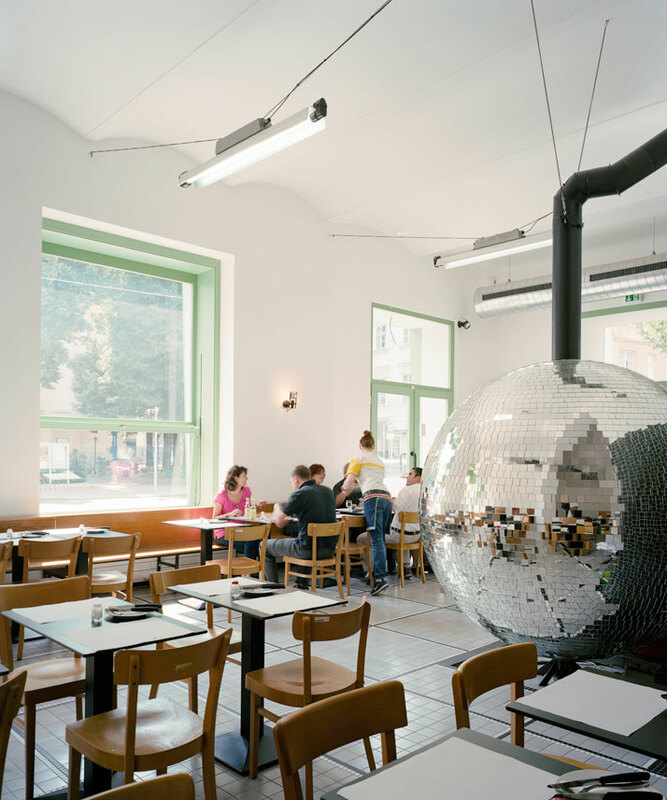 With smooth tiling, strictly narrowly aligned beech wood church pews and chairs around black wooden tables that seat just two people, the slick spartan interiors may look like a refectory but with a rather large noticeable twist: the traditional pizza oven is disguised as a giant glittering disco ball. 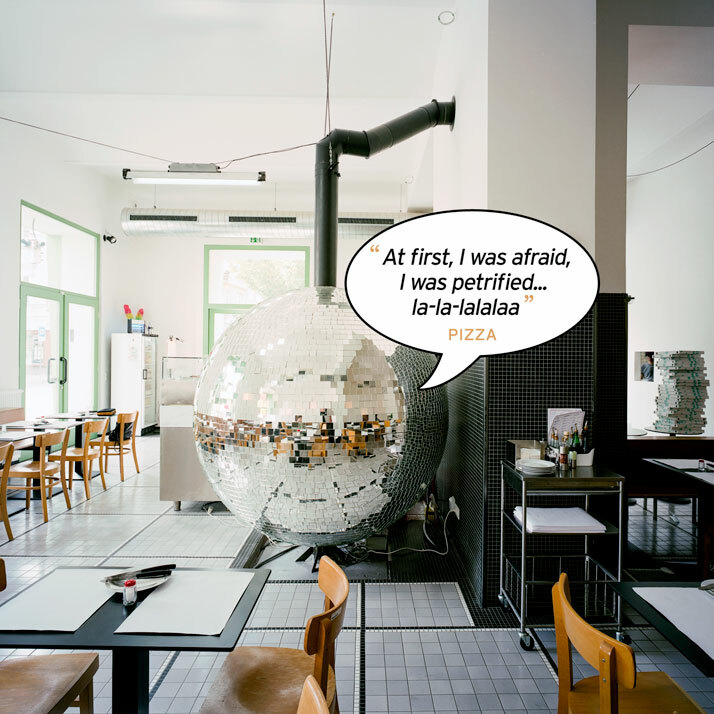 Both intriguing and unusual, Disco Volante’s focal point has been the talk of the town since it opened last September. 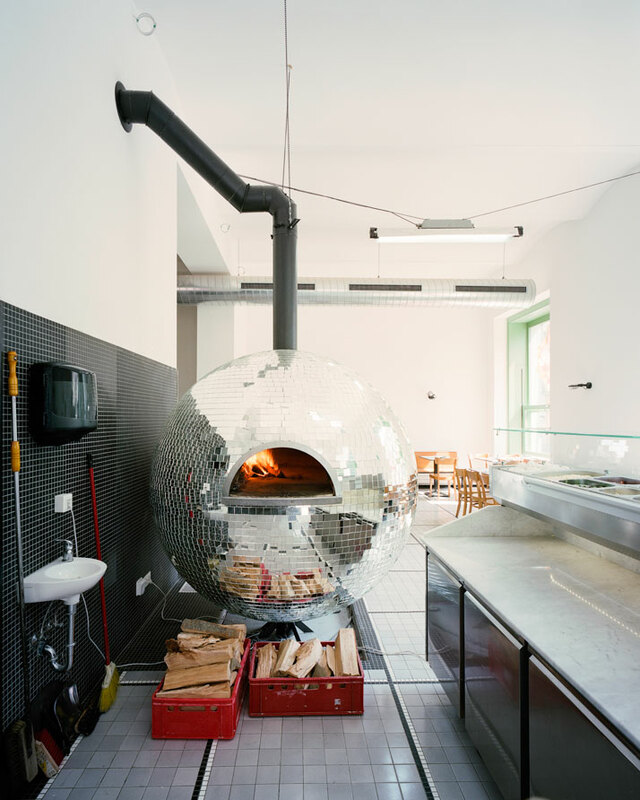 Not only is the pizza oven glitzy, it is also fully rotational, fully operational and very much traditional wood fired (see for yourself). Inside, the pizza turns at one revolution per minute so that the base is cooked perfectly evenly. 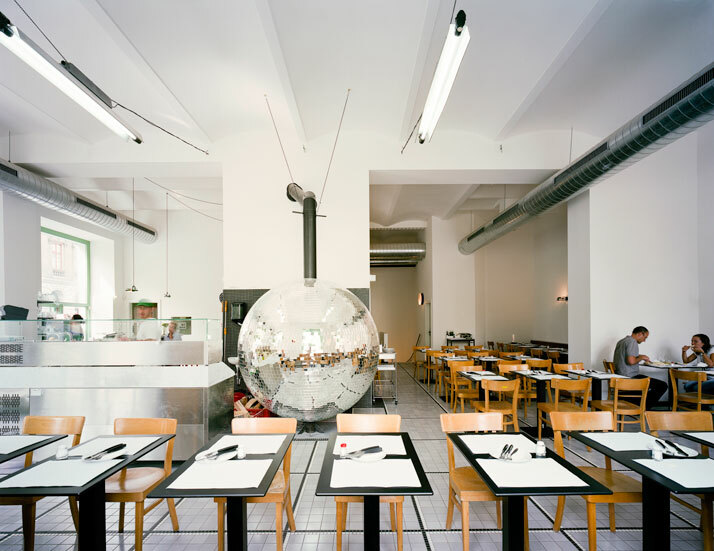 Made from heat resistant concrete, it was created with CNC milling technology to achieve the spherical shell which is covered with about 7,500 specially cut mirror tiles. In the day, natural daylight bounces off the oversized oven to give the darker corners of the room more light. In the evenings, the lights are dimmed and various spotlights are angled towards the ball, flooding the space with colour, dressing the plain white walls and ceilings in flecks of pinks and blues. 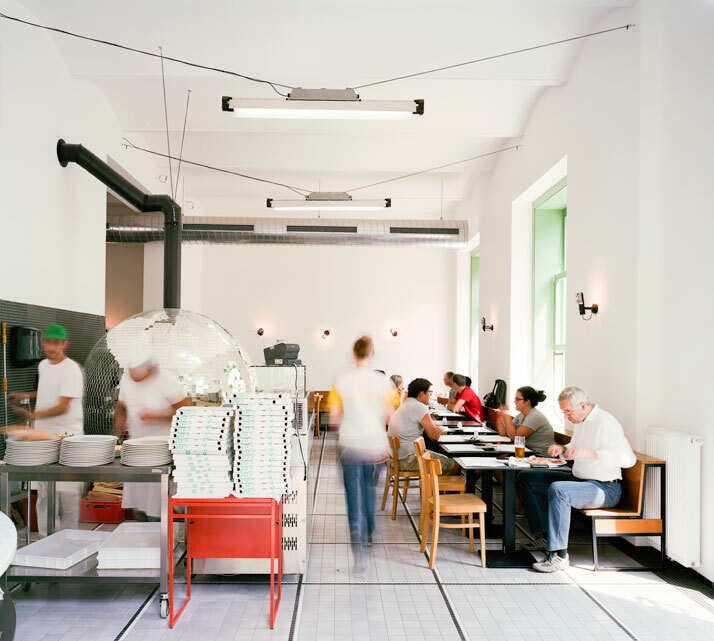 The restaurant’s industrial feel, which can also be perceived as soothing and restful, is complimented by suspended lighting that recalls street lighting and the staff uniforms that resemble mechanics’ overalls designed by Milena Heussler and Lucian Raimondi. 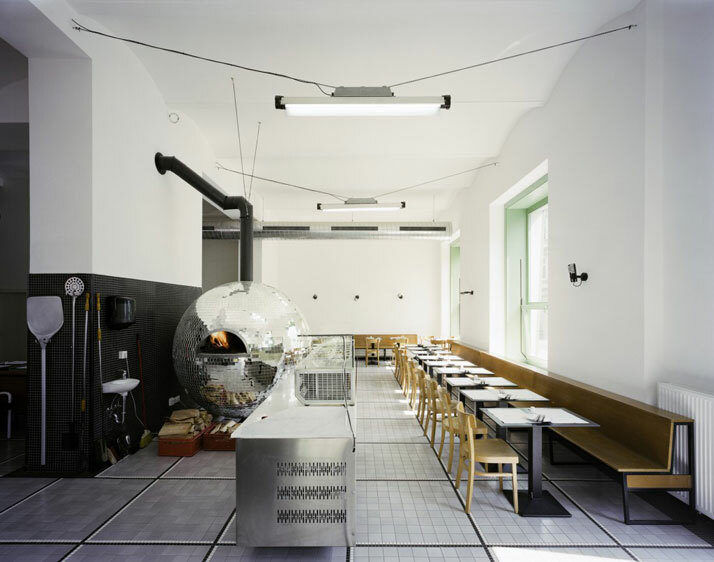 As the bare unadorned room fills with diners seeking Maria Fuchs’ perfectly cooked pizza, the clinical room begins to warm. 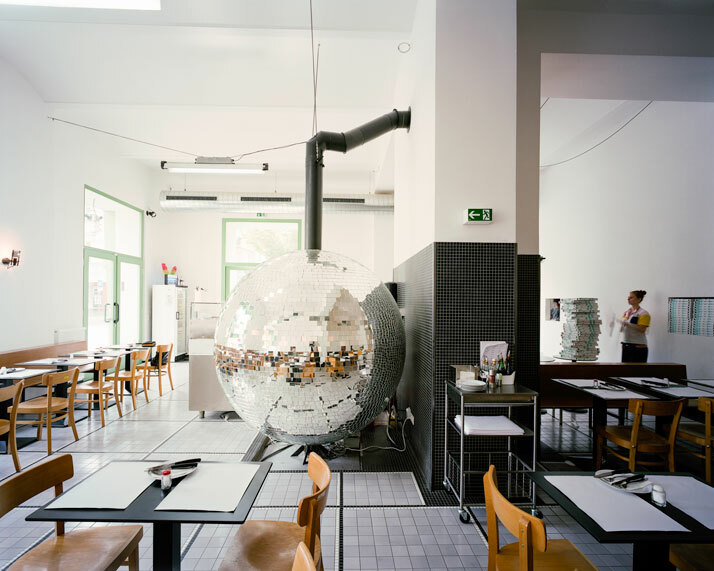 And with completely frill-free interiors, diners turn their attention right to where the designer always intended: on the disco ball. 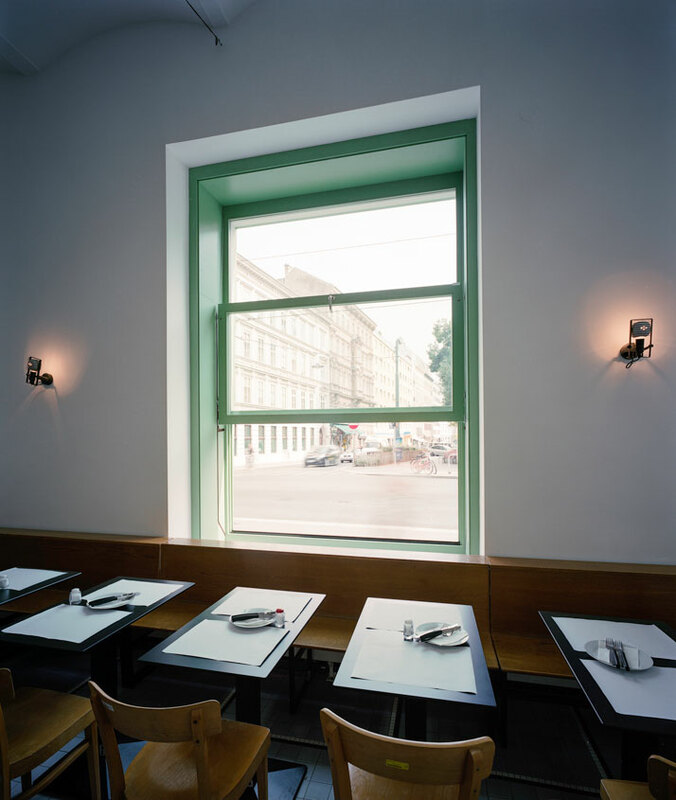 Madame Mohr is a Vienna based creative collective consisting of five architects and industrial designer Lukas Galehr, who have been exploring ethics and aesthetics since 2009. As well as accepting out-of-house commissions, Madame Mohr also develops its own projects. Galehr, now fairly well known for his smooth glazed grey and white ceramic tiling (think a brightly lit bathroom) is creating quite a stir. 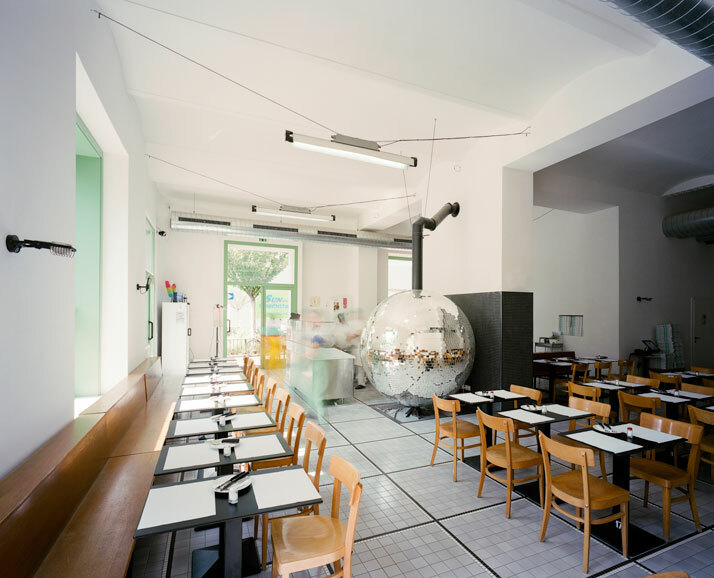 Previous projects include Super Mari, Maria Fuchs’ first space, a 33 sq.m. 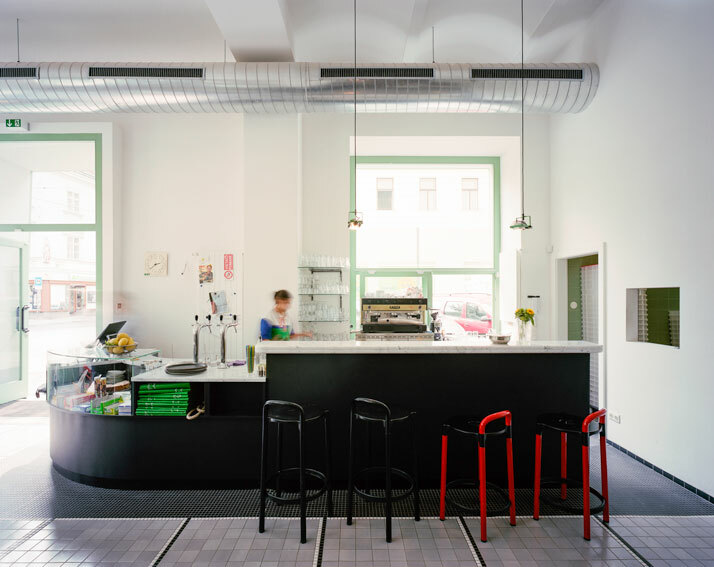 tiny Italian coffee-shop/mini-market in Vienna’s second district characterised by Galehr’s instantly recognisable signature style. photo © Lukas Schaller. (cloud by Yatzer).